Only a small percentage (6.5 percent) of the nearly 122 million households in the bottom three quintiles will actually face a tax increase. Meanwhile, more than 97 million (80 percent) will receive a tax cut. Doing the math the same way the JEC staff did, we come up with an average tax cut of about $450 for those 97 million households. Indeed, at the far end of the chart, you will see that every quintile on average receives a tax cut — not a tax increase...In their haste to condemn the GOP tax plan, Democrats have spread far and wide the false claim that families making less than $86,100 on average will face a hefty tax hike. Actually, it’s the opposite. Most families in that income range would get a tax cut. Any Democrat who spread this claim should delete their tweets and make clear they were in error. 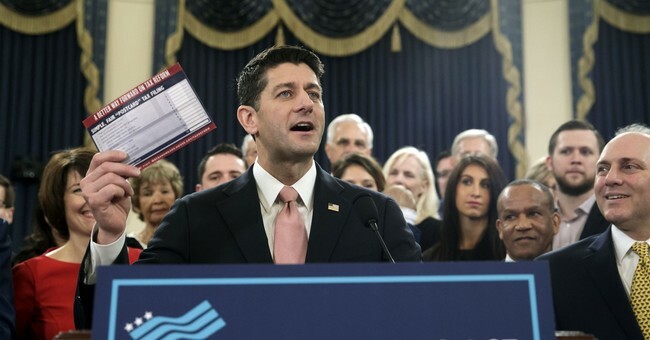 (3) Simplification is a key component of this proposal, with Republicans contending that under the new, cleaner, less complex system, "an individual or family can file their taxes on a form as simple as a postcard." This would reduce millions of households' costs associated with preparing and filing taxes each year, on which Americans currently spend tens of billions of dollars (and more than a billion hours) annually. Overall, there are political risks and pitfalls within this legislation, some of which arise from the GOP's goal of lowering overall rates and simplifying the code without exploding deficits -- even with so-called "dynamic" scoring, which accounts for expected economic growth spurred by reform. The Journal identifies a few of these "budgetary contortions:"
The tax bill, revised repeatedly in the final days before its release, already bears the marks of political compromises large and small, in addition to budgetary contortions needed to avoid creating larger and long-lasting budget deficits. For example, incentives for business investment lapse after five years and so does a new $300 per person credit for filers, their spouses and non-child dependents such as college students. Those expirations mean the tax cuts would shrink in future years unless Congress acts...There are political land mines scattered in the plan, some easy to see and others that businesses and advocates will likely unearth in the coming days. For example, the proposal repeals an itemized deduction for medical expenses, a crucial provision to households with extraordinary health-care costs. It also repeals the tax credit for adoption and the deduction for student-loan interest. The bill also limits the home mortgage-interest deduction. For new home purchases, interest would be deductible only on loans up to $500,000, down from $1 million today; existing loans would be grandfathered. Because of the larger standard deduction, fewer people would have a tax incentive to make charitable donations. Also, here is CNN's sit-down interview with Speaker Ryan from this afternoon.